If you thought Molobaly was too modern I advise you to skip this one. 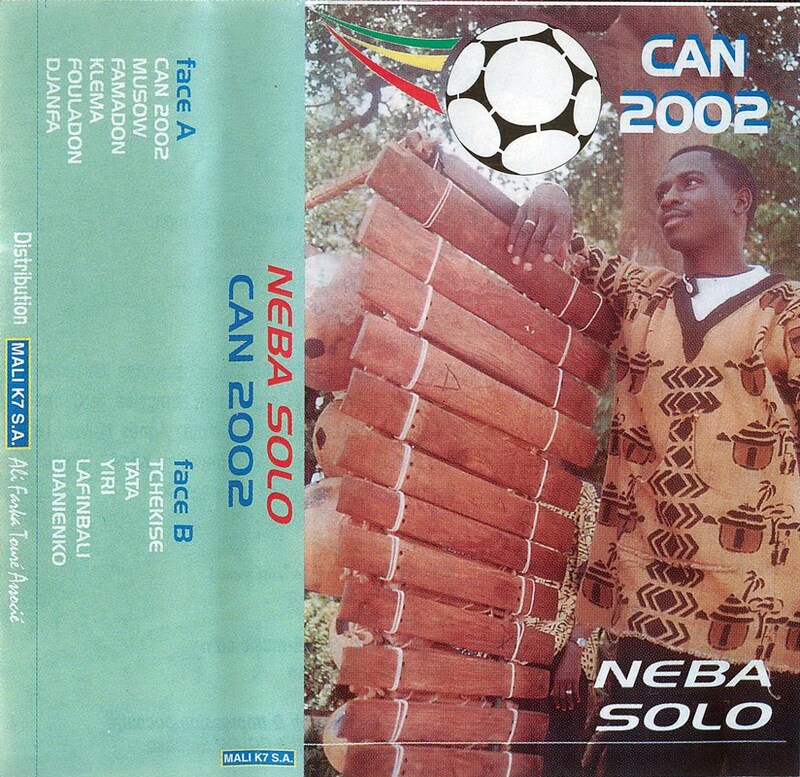 Souleymane Traoré, better known under his stage name Neba Solo*, is musically far closer to the "Balani Show" style than Molobaly. This cassette was recorded with a definite commercial purpose. It was to be a 'hit' at the African Nation Cup, which was held in Mali in January 2002. Should you be interested in who won, by the way, on this wikipedia page are all the results. At the time of these recordings Neba Solo had already had 'hit CD' on the market, titled "Kenedougou Foly". This CD was released on the European market in 1998. All this talk about markets in my opinion is reflected in the music. Personally Neba Solo is trying too hard on this cassette. And I am sure the studio engineers have shown him the way to 'conquer the markets'. Especially vocally Neba falls short of the mark. Not only compared to others, like Molobaly Keita or popular young stars like Dabara, but also compared to his first cassette ("Hommage A Lamissa Bangaly", which I will post later) or even to his "Kenedougou Foly" CD. A video clip of the second track of this cassette can be found here (or here). And a live version recorded 5 years ago in Ntogonasso (which, judging by the name, I guess to be somewhere near Sikasso) of the first track on side B here. And finally here is a video from Malian television, shared by Ngoni on his very promising YouTube channel. * a stage name which I gather carries a reference to the village of Nebadougou where he was born, plus to his own first name. I've been waiting for this tape since 2002, already had some individual songs but the entire brand new cassette is to me a great luxury. Traditional, simple, modern, sophisticated to me is not very important, once the artist has the knowledge can be allowed to seek new paths. My favorite Dianienko the Donso magical environment of "Mogo Te Diya Bee Ye." Complete musician staff at CAN 2002 here. Really nice to have a better sounding version of this cassette than mine. I was in Mali in 2002 but it took me a while to work out what the non pirate cassettes looked like & I bought a bit of a hopeless one. One of the other cassettes I got, Oumou Sangares "Mussowla Diala" also seemed to be aimed at getting in on the football fever. Unfortunately I got a pirate copy of this as well! Have you come across this one? I'm afraid I don't have the cassette you mention. I see that Natari has it (http://www.natari.com/mali.htm). @alex: I've added an extra link to another server. Found a track by Neba Solo (Yere Don) on a radio recording , liked it a lot and searching the web, brought me here (as usual searching for good music! thank you thank you!!). The track I found is from the K7 "Hommage a Lamissa Bangaly", which you mention that you'll post. Couldn't find it in the blog, so did you come to post that K7? Very interested hearing this one! @Mangue: Thanks for reminding me! I'll post it as soon as I've digitised it. But perhaps it is better to post some music by the artist who is the subject of the hommage first? Good news, give me a call when you're ready the gift, I have a couple of videos of Lamissa Bengaly edited. Also I have that from the homage, but not edited, somewhere. OK, fine with me, even more to look forward to!! "a balaphonique course de relais"! !